I’m so excited! This is my first post. All I can say is…uh…salmon! 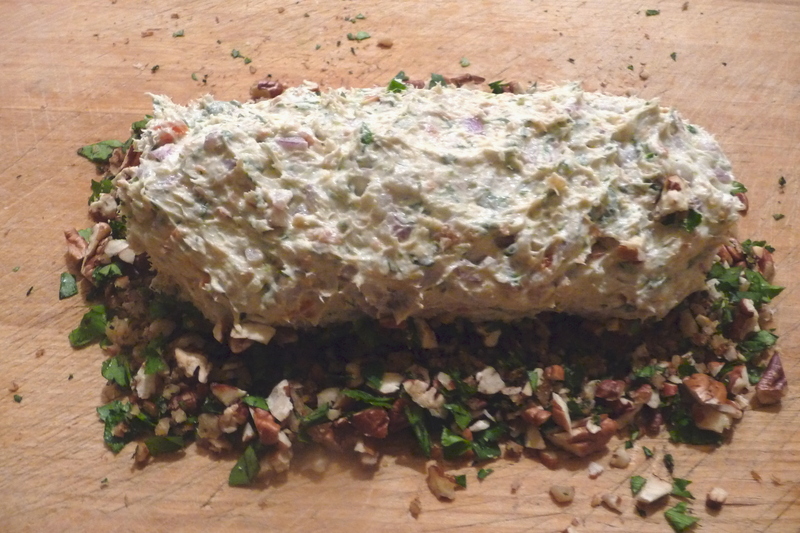 Salmon…molded into a delectable cream cheese and herb mixture and rolled in pecans…oh my…yes, salmon. But, perhaps I should back-up before we dive into this together my Cafe’ friends. Shouldn’t I say more about salmon? Those ambitious and shiny wonders that spawn every year in Alaskan waters give us so many healthful benefits–how about all that healthy protein and omega 3? How about the bragging rights when you catch one? Oh joy! I’m so grateful. Every summer while Ron (“R”) and I visit my mother in Alaska, we do what every person in the Land of the Midnight Sun does. We FISH. Since the FISH in Alaska are big, we catch BIG FISH. Oh…I should inform you that everything in Alaska tends to be BIG. Yes, BIGGER than Texas. .. In fact, there is a big brag sign to prove it. The sign located upon entry to the Great State of Alaska from the Alaska “Alcan” Highway (via the Lower 48 states) is there to inform you that you are about to experience BIG everything. BIG land, BIG waters, BIG moose, BIG fish, BIG people with BIG feet and coat sizes, etc. You get the picture. 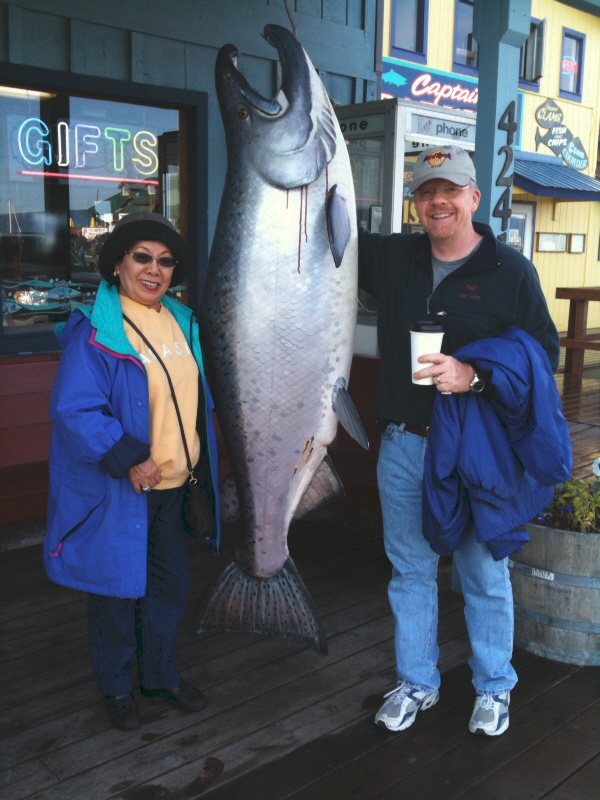 This BIG King Salmon was caught while enjoying a cup of Joe in Homer, Alaska. Well…OK, my nose seems to be getting larger as I’m writing this. Sort of like Pinnochio, you know? I guess this pic is just a bit of Alaskan humor. The truth is that my mother (the petite woman on the left) and “R” are actually proudly displaying what we had hoped to catch on this nice day in Homer, Alaska after we had finished our Joe. Truth be known, that we did not catch the BIG one in Sept. 2009 in Homer on that particular day. However, upon getting back to Anchorage, our home, with little to show of our BIG fisherman skills, our friends came to the rescue. Alaskans are like that. They gave us lots of Kenai River Red and Silver Salmon to bring home to Texas. So we, once again, came home with a cooler full of fish to grill, smoke, and bake into some kind of wonderful delight. 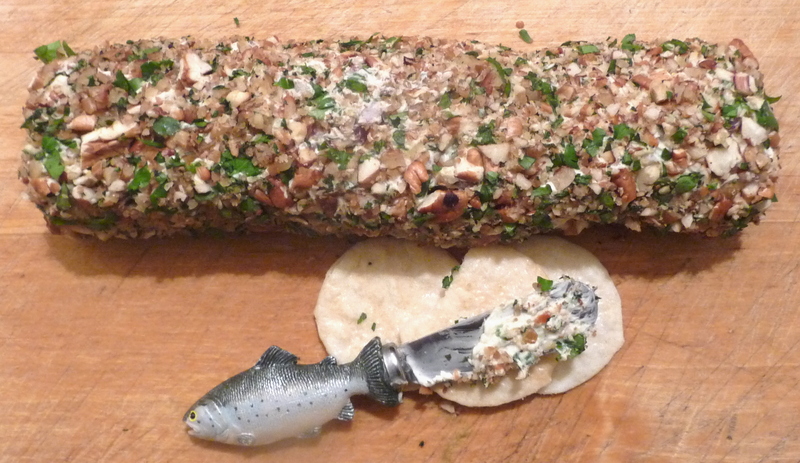 Hmm…How about a few Smoked Salmon Logs? Good stuff on crackers or perhaps a bagel. Let me get a cup of Joe and then we’ll get started here. 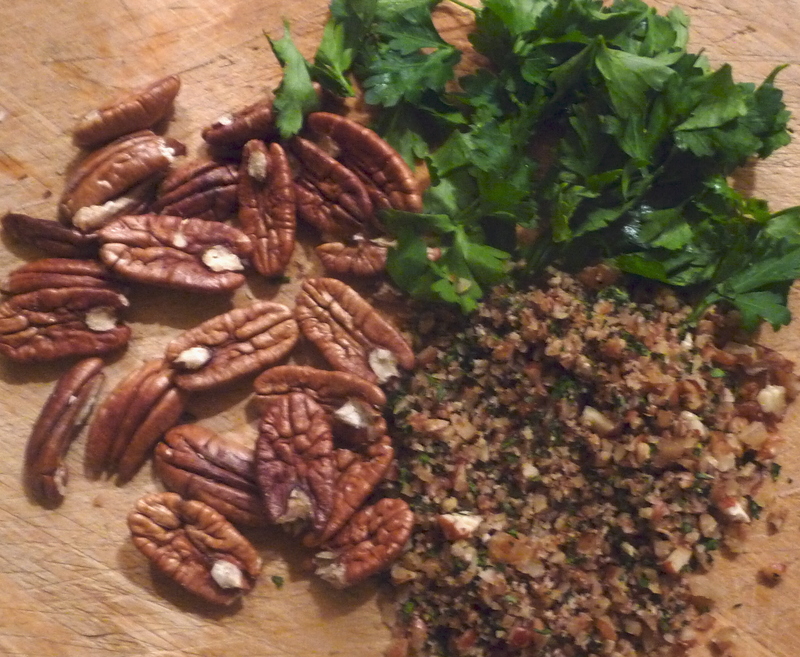 Next, on a clean surface, mix your additional chopped parsley and chopped toasted pecans together. This will constitute your herb-nut mixture. 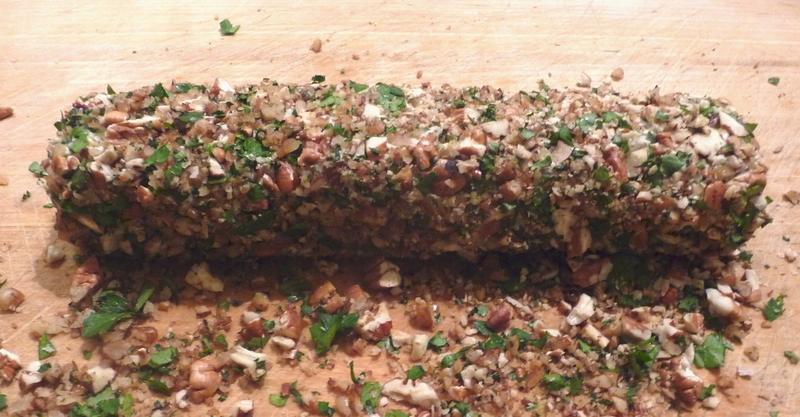 Now begin rolling the cream cheese log back and forth until it is completely covered by the herb-nut mixture. You may wish to roll the log back and forth until it is longer and thinner, perhaps about 2″x7″. Next, you may begin spooning-out the remaining cream cheese mixture and form your 2nd log following the steps above. Or, you may wish to save the rest as a bagel spread–how about a little Sunday brunch? Smoked salmon spread on a rice cracker anyone? Traveler’s Notes: Take note my Cafe’ friends, you too can take your own photo with the Big Salmon in Homer, Alaska. Hint: the Big Salmon is not real…it’s actually sculpted and painted by an Alaskan with a good sense of humor. You can visit it at the Homer Spit while you enjoy your cup of Joe.